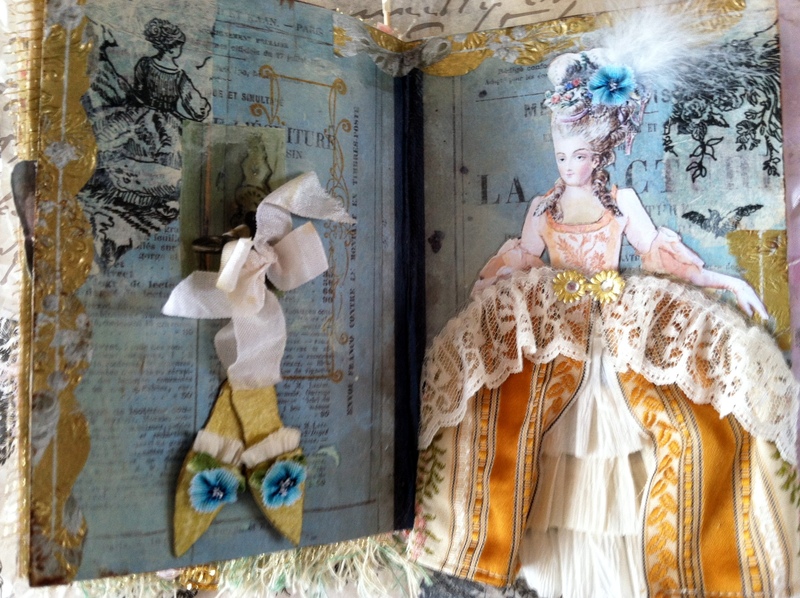 I sent my Tea with Marie altered book out for a round robin with the girls in my local art group last June. You can see the cover and beginning pages here. 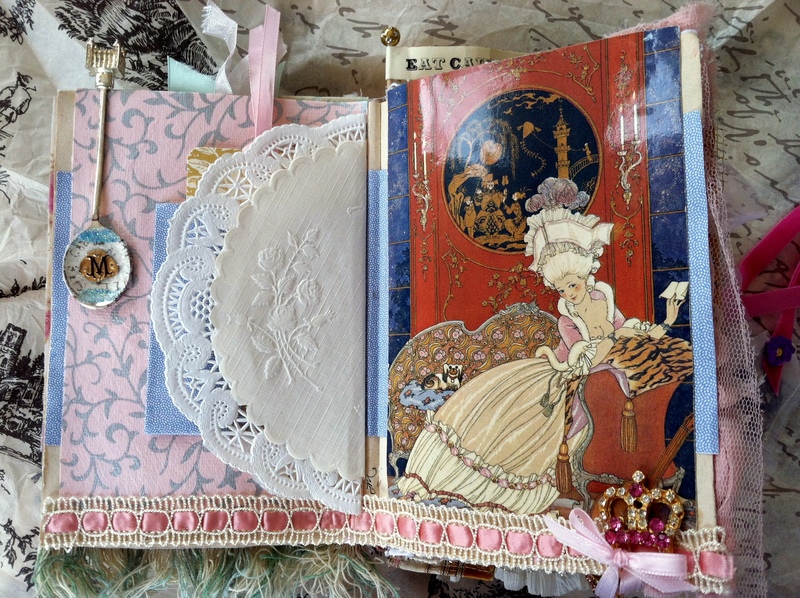 I was just thrilled with the lovely pages they created! This is Lisa’s sweet spread. Lisa used a post card titled Love Letter by Georges Barbier and embellished a silver souvenir spoon with an M from the foil top of a wine bottle. A bejeweled heart hangs just out of camera view from the gold crown. Blooming with pink rose fabric, ribbon and lace and one of Fran’s special rosettes behind Marie’s head. It is a floral fantasy! An indulgent feast of pretty and humor, no? 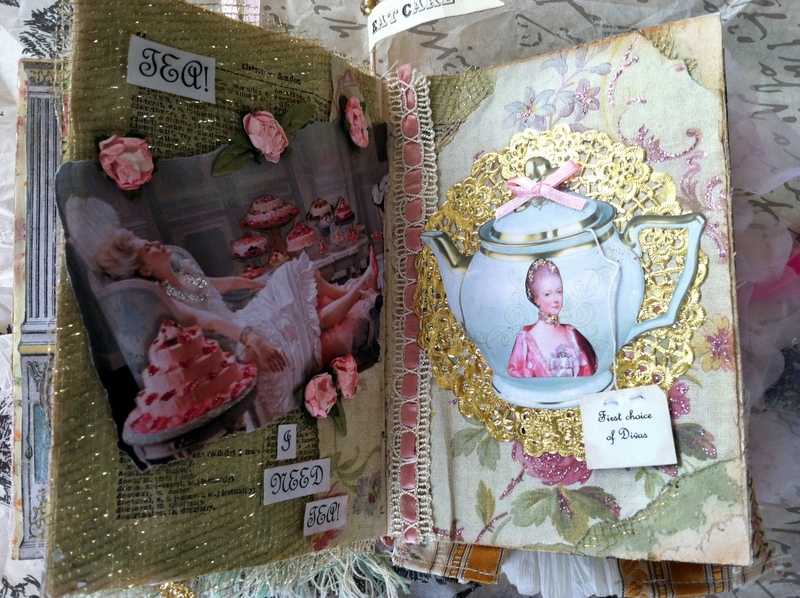 I love her tea tag and the shimmery gold mesh she used in the background. Pretty to a “tea”! And so inspired by these talented ladies I couldn’t wait to do a page! 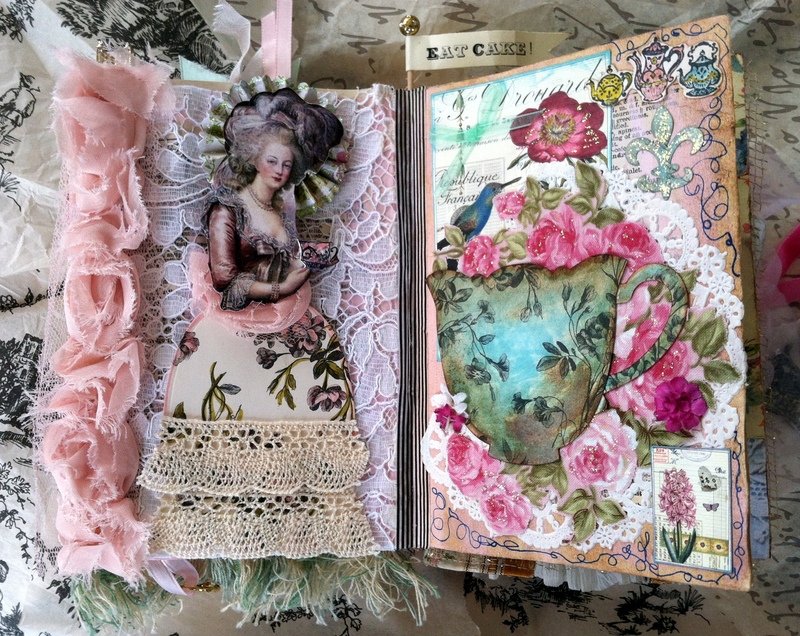 I started with a photo copy of an antique French book cover as my background adding bits of toile patterned tissue paper and gold napkins, from Patty (you can see Patty’s gorgeous spread in my book here), and further ageing with acrylic paint and brown ink. I stamped an embellished frame and sketched armoire doors and added a magazine image of a key to hang my golden slippers from. 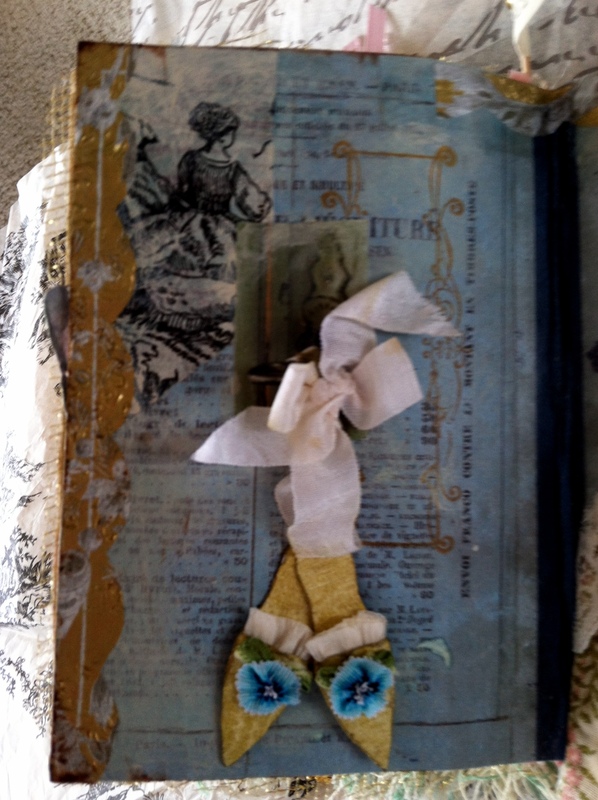 There is a wonderful tutorial by Terri Heinz for making the shoes on her beautiful blog Artful Affirmations. 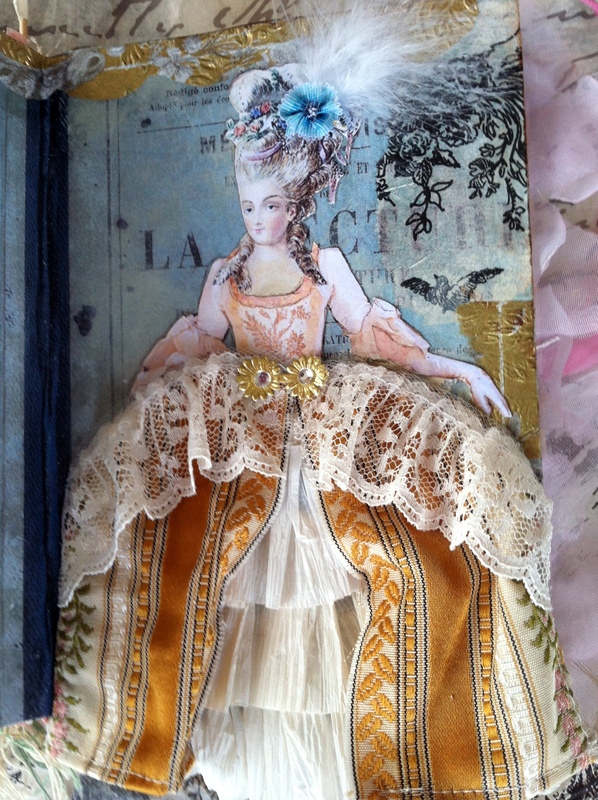 It was such fun to create “Marie” from scraps of clipart images and magazine clippings and then dressing her in a crepe paper petticoat, fabric and lace. Adding flowers and a feather to her hair as a final touch.